Steve had to admit, Tony's new tower was pretty swell. He hadn't actually spent any time in the old one; only when they had recaptured Loki had he stepped foot inside the building. Meaning, he couldn't really compare the two in any sort of fashion, but that didn't lessen his wonder of his current home. His favorite part by far had to be the large common room. As always, Tony seemed to spare no expense in furnishing the room. The couches were plush and allowed Steve to sink right into the cushions. It was really nice for when he was drawing. Being able to just sink back into the couch instead of spending most of his time bent over a table or desk was really nice. Dressed in only a pair of khakis and one of his undershirts, Steve was curled up on one of the couches, a sketchbook balanced on his upraised knees. He had both bear feet resting on the couch seat and his legs pulled tight to his body to give him a solid work space. His left arm was braced against the side of the couch as he leaned against the back of it. With his right arm free to sketch and the perfect amount of light hitting his page, Steve was relaxed. Steve pressed his pencil back to the page. The tip was rounded slightly to give him a solid, but relatively thin line as he traced the curve of a woman's bottom lip. He had started drawing with no real product in mind. Just let his hand and mind draw by feel instead of by design. His drawing had quickly turned human which ended up being a female. The features weren't anything special; just a generic drawing of the female face. She had long, wavy hair that extended past the edge of the drawing with a part to the left. Her nose was wide and straight, sitting between a pair of soft set of eyes. A pair of small eyebrows rested above them. Her chin was slightly rectangular, giving way to am almost square jaw. Steve was still filling in her full set of lips, darkening the line between them and shading slightly to give the illusion of a light source. Taking his ring finger, Steve gently rubbed over the line he had just made, softening the edges of his pencil and blending the varying amounts of grey together. He was almost done with the sketch after about two hours, and given it's impromptu nature, he was fairly satisfied with his work. Not that there was much technical details he had to worry about. Maybe he would try to draw the Iron Man armor next. Midgard had changed greatly since the last time that Sif had spend time here. Oh she had come to Midgard to bring Thor back to Asgard, but it had been only for a short while so she was unable to fully see how much the place had change. But now she had decided on her own to see what was so wonderful about this realm that called Thor to journey here so often. Not having to go to the Biforst now in order to travel the realms, thanks to Odin's gift, it made slipping away into Midgard without anyone knowing not only possible but easy. All she had to do was take her broadsword and with the right combination of swings she could cut a hole and walk right into a different realm. So Sif slipped through and now found herself in Park in the middle of London, England, already a group of people where surrounded her for she had pretty much appeared out of nowhere. Not to mention she was to their opinion strangely dressed and carrying a sword and shield; making it very clear she was either not from around her or she was part of some strange promotion. Seeing as she just appeared out of thin air she was most likely not from around here. For a while Sif looked at the humans and they looked at her, the crowd slowly getting bigger. At the moment Sif did not feel threaten, for she knew she was stronger than they were for they where nothing but mortals, but this did not mean she was going to let her guard down. She would not attack unless they did first, but she did wish to know where she was. "Tell me what place is this?" She asked out into the crowed who just looked at her, her strange speech lost on them. Clearly she was not from around here and with the memory of the last person that spoke as she did fresh in their mind the crowed quickly grew angry. They did not know nor did they care she came without the intent to hurt them, they were not about to let someone of her kind to once again cause such damage and pain as Loki had in the States. It would be a man with a bat that would strike first. "we don't want your kind here." With words of anger and swing his bat, Sif throwing up her shield in order to protect herself, the fight was on. It was one Asgardian warrior woman against a crowed of ten mortals; though she did give them a chance keeping her sword stored away, using only her shield to protect her and her fist to hit back. It wouldn't be long for someone to be called in to handle this, someone much stronger than a normal police man would need to be called after all what chance did they have. "Captain Rogers, it appears that a minor incident has arisen in the park." The mechanical voice jolted Steve out of his thoughts. "I believe an associate of Master Thor has just arrived on Earth." Letting a deep breath escape, he stood up and tossed the sketch book onto the couch. ""Thank you, JARVIS," he responded, ignoring the urge to look up at the ceiling when he spoke. His feet were already in motion, carrying him back to his room where he kept his suit. No doubt a sudden visit by an Asgardian would spell some kind of trouble and Steve was almost tempted to see which of his teammates were in the area. He quickly shelved the idea, deciding not to alert some of his more action heavy teammates (Tony) before he was sure there couldn't be a peaceful solution to this problem. 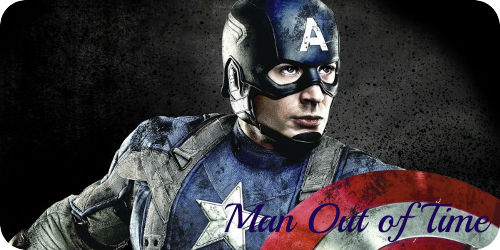 Quickly, Steve tugged on his suit, leaving the cowl down as he slotted his shield onto his arm. He jogged out of his room with his belt still in his hands, fumbling to click it into place around his waist. The elevator was already open and waiting for him (thanks, JARVIS), allowing him to dash inside. He tugged to cowl over his face as he was lowered to the lobby. Without any ability to fly or leap tall bounds, Steve was left with only his feet to carry him. That suited him just fine. As soon as the elevator door opened, Steve was off. He dodged around an intern with a stack of papers, who still dropped his load in surprise. Tossing out a quick sorry over his shoulder, Steve burst through the front doors of the tower and onto the streets. It didn't surprise him that the sidewalks were crowded with people; Tony wouldn't have built his new tower anywhere but the busiest part of the city. Instead of fighting his way through the mass of people, Steve took to the street. The large red, white, and blue blur moving past regular traffic caught the attention of the drivers, leaving a symphony of horns trailing behind it. Several times, the Captain had to roll over the tops of cars too slow to move out of his way. He pointedly ignored the curses and shouts from angry drivers, focusing, rather, on his destination. Even with all of the hurdles and objects littering his path, Steve was able to reach the park in what he would consider one of his best times yet. It wasn't hard to see where the commotion was. One woman in battle armor was surrounded by a bunch of every day men, a few with bats and other makeshift weapons. Really, what was it with Asgardians and making a scene? Steve breathed out a small curse at the sound of sirens coming closer. Sure, why not make it a bigger scene? He began to slow down as he came upon the group, letting his eyes scan over them to try and piece together what the hell was going on. It surprised him to see that the woman's sword was still sheathed in her own shield. She didn't seem to be attacking them, merely defending herself. Clearly she was not the threat. Letting the shield slide off his arm and into his hand, Steve gripped the metal tight. He brought his arm back and took a step forward and he snapped his arm forward, the shield rolling off his middle finger in a near perfect release. The large hunk of metal sliced through the air, coming in between the goddess and a bat just as they were about to connect. It caused his shield to wobble in the air baddly, but it still managed to arch back to his hand where he returned it onto his arm. Sif did not need her sword, she was able to fight back those that dare attack her with her other skills she had learned. After all she wasn't here to kill Midgardians, she was here to find out what it was that Thor liked about them so much; and as of right now she was growing to have a deep dislike for them. Sif used her shield in order to protect herself form the strange clubs that they where caring, using her legs to kick out and her other arm she was able to keep them back. The trouble was they didn't know to stay back, but kept coming at her. There was more on the way as well, she could hear the strange call of their war horns. Midgard was declaring war of Lady Sif, and she was truly out numbered but not willing to go down. After all she was the goddess of war, having faced greater threats than this. But Sif was clearly starting to lose her patients with these mortals. Sif did not noticed the new comer to the crowed, how could she when it seemed as if the crowd was growing by the minute and she had to keep her focus on defending herself. Seeing a man with the strange club, Sif threw up her own shield to protect herself but she did not feel the contacting blow but heard the club hit something else. It was then she saw the flash of metal as it returned to it owner. For the moment the fighting had stopped when Captain America came onto the scene. For a moment she just looked at him, her eyebrow raised slightly at the strangely dressed man. A few people in the crowd shouted at him that it was none of his concerns, others demanded they take her away like Thor had done with Loki. While the rest just ignored him and once again started their assaults. Sif was tired of this, and she was ready to end it. Finally drawing her smaller blade from the top of her shield she swung it around a bit; a few people back off. "Thou wish for a fight, thy prayer is heard." With one swing she cut one of the bats in two as the attacks started to take on a whole new force. Things were escalating quickly; more and more people becoming empowered by the actions of others. Any more people arrive and it was sure to be a riot. Steve had to move quickly to squash this outburst, but move carefully through these people. They were civilians and he couldn't just start throwing punches at them. Words weren't going to work anymore. These people were too wound up for them to listen to him, even with his iconic status. He would have to gain their attention and respect first. Jumping into the fray, Steve used his shield to block the swinging of weapons. He didn't let their hands or feet strike it, however, not wanting any busted bones. Instead, he simply dogged and blocked. There was no offensive strategy being used. "Everyone just calm down," he ordered, knocking the bat free from the grips of a man. He grabbed the arm of a teen holding a pipe he had found on the ground and twisted his arm behind his back, forcing the kid to let go. "You're all just going to get hurt if you keep this up. I've got this under control." Yeah. Control. Letting the kid go, he blocked a wild punch aimed his way. Out of the corner of his eye, he watched the Asguardian woman pull out her sword. Now she was a threat. Pushing some of the rioters aside, he aimed to catch the swing of her sword on his shield. "I'm going to have to ask you to put that away, M'am. You're only making things worse." Behind him, he could hear the arrival of the police. He could hear them shouting for the fighting to stop and watched as a few people listened. He couldn't concern himself with the police right now. This Asguardian was his top concern. The sword came down in order to cut the large stick someone was swinging at her but instead it came down on the shield of the strangely dressed man. "I am making things worse?" She elbowed a man in the rips that came up behind her to try and grab. "I am not the one that started this fight, nor does it seem that thou has it under control either for they are attacking thee as well." Sif was angry that was clear but she was not attacking to kill but to disarmed the fools that dared to attack her. She had not come down to Midgard to look for fight but it was clear these Midgardian where fools to dare to attack her. She would not have bothered a one of them, except to exchange some pleasant talk if they would have let her be; but they had been the one to come out swinging and she was going to end it. There was something about this strange man that told Sif to trust him, he almost seemed like someone that Thor had tried to explain to her about; a friend on Midgard. So against her better judgment she put her sword back into the shield, ready to use again if the need came. Using her arms and shield now in order to protect herself and push people back. A few people got lucky; mostly cheap shots from behind; and hit her but their strength did little to hurt Sif; if anything it annoyed her. It was the sounds of the sirens coming their way that startled Sif, she had never heard such a sound as it before and was sure it was a cry for more to join the fray; just as the war horns on Asgard where used. "Doth thou hear they call in more troop with their strange horns." She was ready to pull her sword out again, after all they were calling down a war and she was the goddess of war; she wouldn't run but fight. Depite her obvious reluxtance, the woman put her sword away and Steve began to relax a little. Things seemed to be getting at least a little under control again. People were still swinging and fighting against them, but the had begun to join the fray. Their presence seemed to be helping cool things off; already a couple of people were in hand cuffs. "No, I don't, but you posing a threat to these people is not going to help anything at all,” he said, ducking out of the way of a bat. Steve couldn't help but wonder if this was one of Thor's friends or if they simply knew each other. From what he had found out, it seemed like Thor was the prince of Asguard and Steve didn't know how that translated into relationships with others. Or if this person even liked Thor at all. Apparently, Thor's last grudge match had nearly leveled a small town. If this Asguardian was here to cause trouble, she would be taken down. If she was here as a friend, Steve would welcome her with open arms. "Those's aren't troops. They're police officers. They're coming to try and break this up.” He just hoped the police didn't try anything crazy. Like attacking the Asguardian. This was already turning into a big enough incident and he was sure he'd be hearing about it later from Fury. He didn't need SHIELD to actually show up and make a bigger scene. Pushing several men away with one swing of her shield arm, Sif glared at the strongly dress man. “I posing a threat, I did nothing but walk across the field and was attacked.” As a matel bar was brought down toward her head, Sif stopped it with her hand and yanked it out of the man’s; using it she pulled the legs out from under him and tossed the weapon away. “Are all Midgardians so ready for a fight they will attack the first person who appears when the person has done nothing to cause them harm.” Anger was clearly swelling up in Sif but she did her best to keep it under control; for to lose her temper would mean that humans could and would be hurt. She was after all much stronger than they were and could with one blow cause serious harm if not death. Sif was not too sure about the strange noise coming their way, nor the strongly dress people who climbed out of the beast with flashing lights on their tops. Each person climbing out seemed to have a weapon and where yelling; some seem to drag the crowed away but all Sif could feel was that she was being surrounded to be once again under attack. Granted she was still under attack from the few people that wanted to get their hits in before they were dragged away, but now it appeared that these poler-ice men were to be more danger. “Not troops than why do they where same armor, why do they carry weapons these poler-ice men you speak of.” Once again she felt the need to take up her sword, for it was clear to her that these strange dress men and women were not friendly; and that perhaps the strange shield man was not a friendly as well. Maybe she had misunderstood Thor when he had spoken of his new Midgardian friends, maybe the one who carried the red,white, blue shield had not been friendly but an enemy. Steve had to stop this riot before it got even more out of hand. And that meant doing something about the unwilling cause of it all; the Asguardian. Already, he'd let it get way too far out of hand by getting into the fight. He was putting these people in danger by allowing them to continue fighting and this woman was teetering on being ally and foe in this fight. It seemed that at every little transgression against her needed to be solved on the battlefield. That was one thing the two of them could agree on, these people where in the wrong. Sif had not come to Midgard to cause trouble, she had come to learn. To see what had changed in the few thousand years since the last time she had visited. “I am not Loki, nor do I stand beside what he tried to do.” Is this how it was going to be now if any Asgardian came to Midgard, they would be treated as such because of Loki. Sif could understand now why they had attacked her, why they would be scared of her. After all they had only known really of two other Asgardians, one being Loki and the other Thor; so in their eyes it was a fifty fifty chance that an Asgardian would be either friend or foe. This cause Sif to still herself from the fight, though she still used her arm and shield to block any attacks that where aimed at her way. She did not wish for this Midgardians to hate her or to fear her; for she was not here to attack them. She wasn’t here to take over their world but to merely learn what it was that Thor found so interesting about this place. But now she could see where she had gone wrong, she had defended herself as they had attacked her; standing her ground as a warrior instead of trying to walk away from the situation. Not that that would have fixed anything but it was possible that this riot wouldn’t even had started. “I am not here to break laws of Midgard, I shall still my sword and put my trust in thee. I hope that thou art a friend and I am not about to make a foolish mistake to trust one that wish to place harm on me.” That was Sif’s answer as she removed her shield; her sword still attached; and placed it once again on her back. She did not however stop protecting herself but she did not attack anyone; instead she just used the gantlets on her arms to protect from any blows.